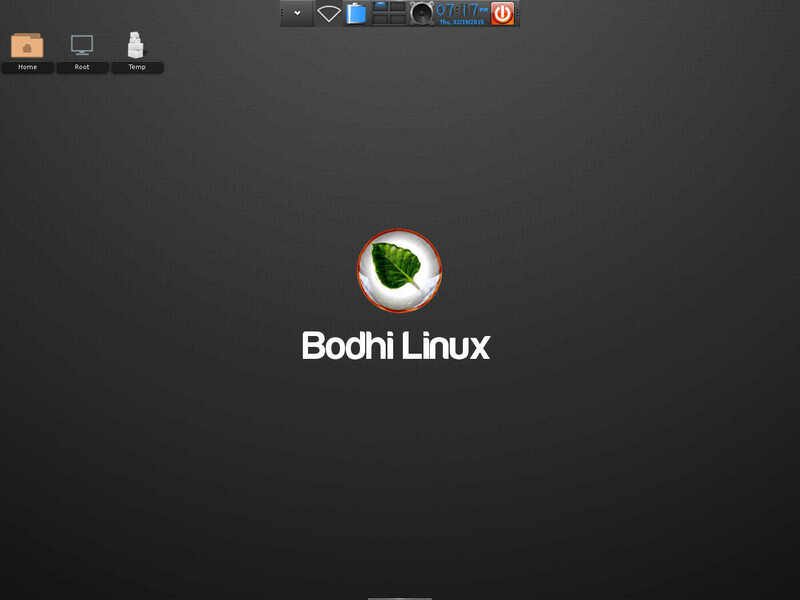 There are many reasons why people use Bodhi Linux. Some use it because they really like the Enlightenment desktop, and Bodhi has pioneered the integration of Enlightenment to create a distro that is both beautiful, elegant and functional. Others use it because they want an operating system that stays out of their way, and although Enlightenment offers plenty of whistles and bells for those who need or want them, it can also be configured to be highly minimalist and use a very small amount of system resources. Out-of-the box and freshly installed Bodhi 3.0.0 Legacy edition. Because of this, Bodhi can also be a good choice for people using older hardware, especially for those who might want to run some “heavier” programs than many made-for-old-hardware distros allow. With this in mind, Bodhi now offers a special “Legacy” edition, developed especially for older hardware. The 3.0.0 Legacy ISO, which can be downloaded from the Bodhi website, features the 3.2 kernel and works on 486 or newer machines, including non-PAE hardware. 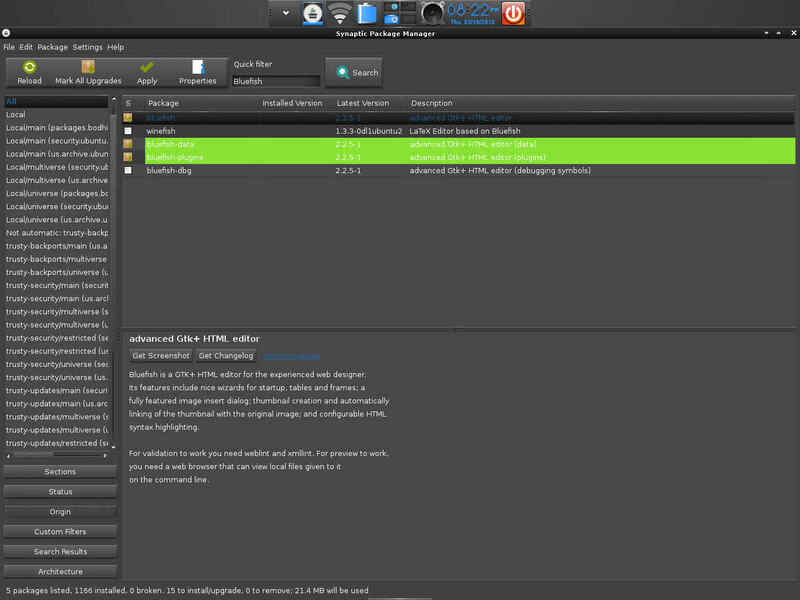 It also uses Enlightenment’s E17 desktop instead of the E19 version which is on all other 3.0.0 Bodhi releases. A little while back, when interviewing Bodhi’s lead developer Jeff Hoogland, he recommended that I try Bodhi’s Legacy version when I mentioned I’d be loading 3.0.0 on an older Dell Inspirion laptop to give it a test run. Unfortunately, when I tried the Dell and Bodhi Legacy didn’t get along, evidently due to some kind of hardware conflict as the install constantly stalled in the “configuring hardware” stage, so I grabbed another, even older, laptop — an IBM branded Lenovo ThinkPad with a 1.6 GHz processor and 256 MB RAM — and booted it to run “live” from a USB thumb drive. After checking to make sure the Wi-Fi was working, I hit “install.” Less than fifteen minutes later, I was up and running. 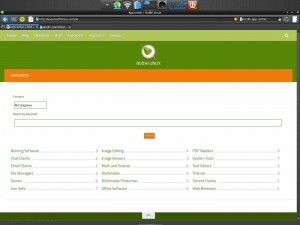 The Bodhi Appcenter is designed to work with the Midori browser, which is installed by default. The ThinkPad had originally belonged to my roommate who’d bought it refurbished from a friend seven or eight years ago, with Windows XP Pro installed. It had never been a very good machine for her, and in the last year or so it’d become all but unusable, always too busy swap filing to get any actual work done. I finally tired of trying to keep it running for her, and gave her a more modern computer, a 64 bit Gateway running Linux Mint with Xfce, figuring I could use the ThinkPad as a test machine. This was its first go at attempting it’s newly found purpose, and using Bodhi’s Legacy, it ran like a charm. 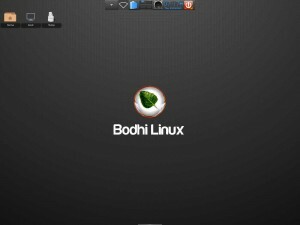 By design, Bodhi Linux doesn’t install much software out-of-the-box, as the Bodhi team figures there’s no need to load a hard drive down with programs that’ll never be used. If a user needs or want’s something, then the user can install it. The first thing I wanted to do was to see how this obsolete machine would handle the load of a modern office suite, so I went to the Bodhi Appcenter, which offers one click installs for certain programs, reminiscent of the old Lindows/Linspire Click’N’Run feature. From the lightweight Midori browser, which installs by default in Bodhi, I clicked the “Install” button for LibreOffice and a few minutes later I was opening Writer. 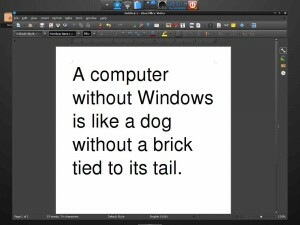 LibreOffice Writer in Bodhi Linux 3.0.0 Legacy. I copied and pasted an article I’d been editing from an edit screen in the back end of FOSS Force into a new Writer document and worked on it for a while with no problems. LibreOffice was responsive, with no hangups or latency as I would expect on this old hardware. As I never work with spreadsheets or presentations, I didn’t work with any of LibreOffice’s other features but figured they’d work equally as well. Now it was time to push the limits of the old ThinkPad a little further by processing some of the screen shots I’d been taking for this article. I’d been saving them in high def mode and when I checked them using the Enlightenment File Manager I found that, just as I suspected, the files were much too large for the Internet, where bandwidth is at a premium — meaning it was time to install GIMP from the Appcenter to do some crunching. When using Windows, opening large graphics files gave the old ThinkPad conniption fits, but in Bodhi Legacy they were easily handled and opened immediately. 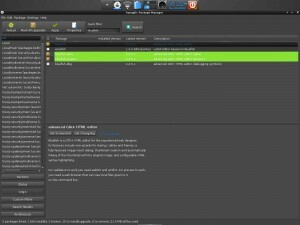 Normally, I would’ve reduced the file sizes primarily by scaling the images down to a size that would fit our columns here on FOSS Force, but for these screenshots I wanted to keep the images large, so I compressed the JPEGs down as much as I could and still keep a reasonable picture quality. The process went smoothly and the laptop remained responsive, with no long pauses caused by a bogged down processor. Next up was to install Bluefish, which is where I get most of my writing done. Like many writers, I seldom use a word processor because writing requires little to nothing in the way of formatting, which is basically what word processors are good at. I’ve found that a text editor uses fewer resources, with the added attraction of fewer distractions. My editor of choice is Bluefish, which is designed for coders. Although I’m not a coder, I find it useful when writing for the web because it affords me the opportunity to easily add any HTML I might require with a click of a mouse. Bluefish isn’t available on the Bodhi Appcenter and would need to be installed from the Ubuntu repository, which would mean using either apt-get from a terminal or using Synaptic from the GUI. I chose the later, mainly so I could get a screenshot. Bodhi doesn’t install Synaptic by default, but does offer a button for a down and easy install on the Quick Start Guide screen which is displayed the first time Bodhi is opened. One click, a short wait and Bluefish was installed. Unfortunately, Bluefish gave me my only disappoint of the night. The problem had to do with the color scheme of Bluefish in the Bodhi default theme. Bluefish highlights the active line of text, so the line the user is typing in is always highlighted. This is a problem, because in the Bodhi theme, the text is white, to accommodate the default black background. Unfortunately, the highlight is also white, making the text invisible, or nearly so. 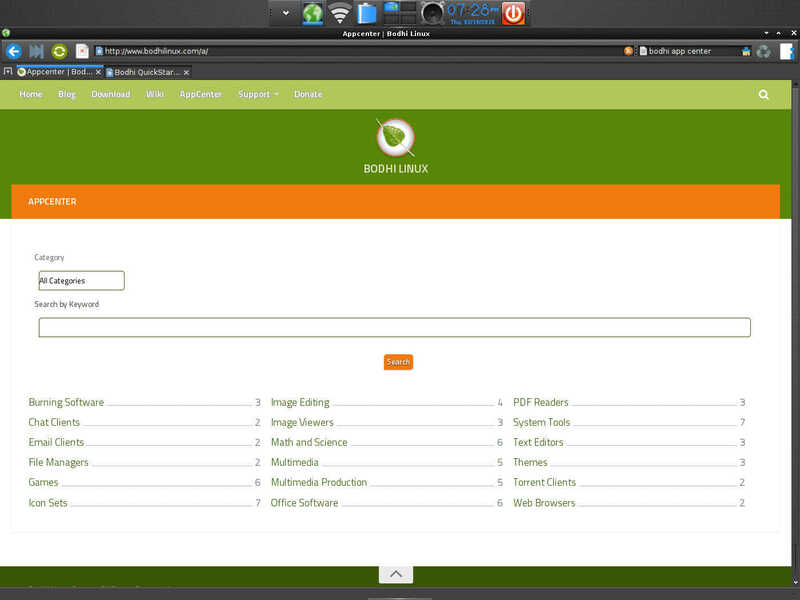 Bluefish text editor in Bodhi Linux. Oh well. I’m certain there’s an easy work around for this and when I have the time, I’ll figure it out. It would be nice if the gang at Bodhi could to work on this and fix it by default, but I’m sure they have more pressing things on their plate and that this will be a very low priority. One thing that most people using Bodhi are going to want to do is to install another browser to augment Midori, the default browser. Midori is a sweet little browser, as light as a feather and faster than an Indy car racer, and is perfect for most purposes. Occasionally, however, Midori falls a little short, so Bodhi users would be well advised to have a backup browser installed for situations which Midori can’t handle. Just such a case happened the other evening when I was preparing this article for publication. After finishing my work on the screenshots in GIMP, I logged into the FOSS Force back end to upload them using WordPress’s multi-file uploader. Trouble is, it didn’t work. Instead of pluging me in to the file system of my local machine, I got nada. Zip. Nothing. This was no surprise. Upon logging in to WordPress using Midori, WP throws up an error message, suggesting the use of a more modern browser (WordPress thinks Midori is an old version of Firefox because that’s what it’s been told by Midori). Installing either Firefox or Chromium is as easy as pie and much easier than pi. Both are available for one click installation on Bodhi’s Appcenter. Thanks for this great review of the legacy version of Bodhi 3. I haven’t seen a legacy review, only the latest e19 versions. I also use Bluefish as my text editor under Bodhi. I have found that one can easily change text styles (inluding font and background colors) under Edit>Preferences>Text styles. You can also re-order the style priorities, which is a nice feature. @Jesse Thanks for the heads up regarding Bluefish. I figured the solution would be simple. I was just going to have to wait until I had the time to find it. Now, with your help, that’s no longer necessary. 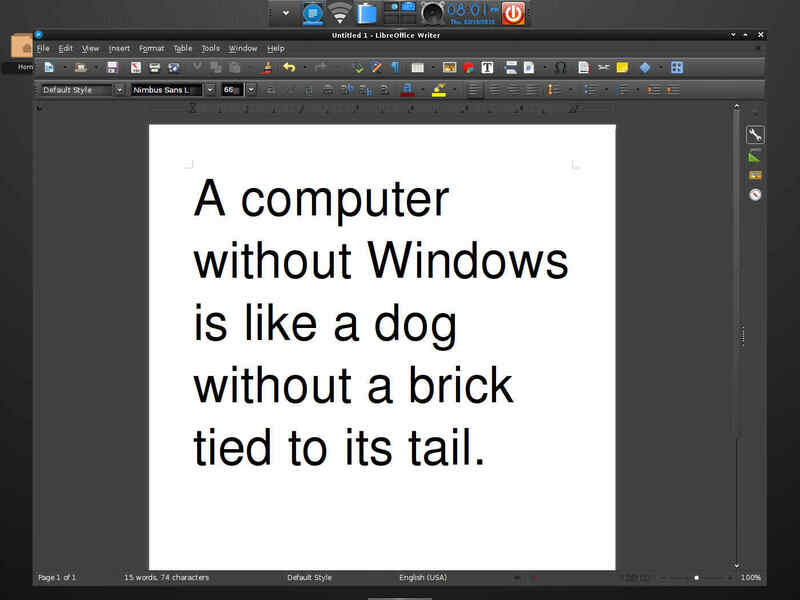 That’s what I love about the FOSS community! +1 for saving me from trouble. 🙂 Thank you. Technically don’t need it *yet*, but I’m cruising around Distrowatch for a lightweight distro, thinking of maybe this old laptop of my mom’s, trying to figure out this Bodhi thing, clicking on reviews to check out options… BAM… here this is, right on the sidebar of the review I’m reading! Kudos to the authors and people involved in this website. The articles I’ve seen so far are very informative, extremely interesting and well-written, and beautifully easy on the reader (introduce information clearly without making a newbie like me feel like an idiot). Again, a thousand thanks. How is it that I’ve never stumbled on this site before??? It’s good to see another edition of a distribution that makes good use of old hardware. I always find it interesting to resurrect computers that people thought were useless. This makes me think of a cast off IBM Thinkpad R31 that I have, which was apparently manufactured in 2002. It has an Intel video chipset that tends to be a bit flaky, and won’t work correctly with several kernels. At the moment, I have Salix Fluxbox 14.1 running on it. I would hesitate to try something else because of the video bugginess which seems to make it so only kernels older or newer than a certain recent range work. The biggest issues I have found tend to be some Web pages demanding a lot more resources than pages generally used to, and the inability to run video higher than 480p. You can still use SMTube with playback set to 480p to browse YouTube videos, though some videos will not work through SMTube. 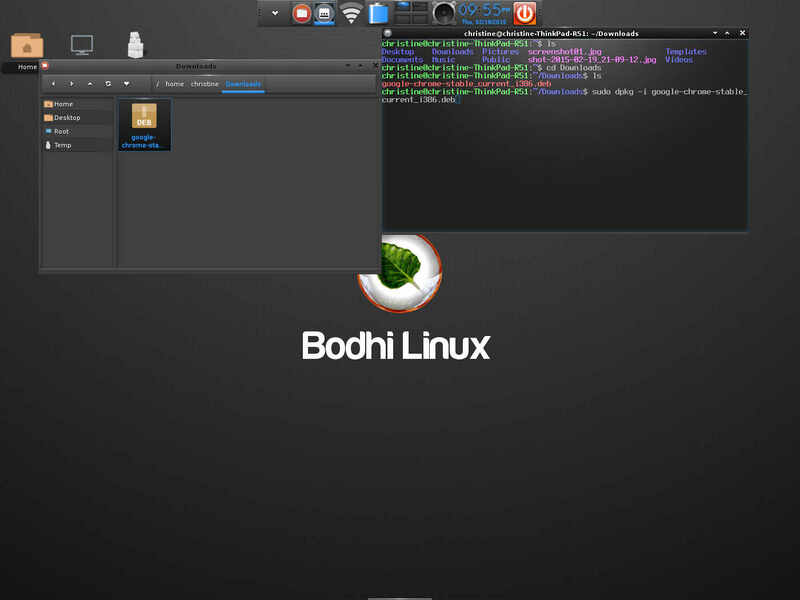 i would like to have WPS for my system Bodhi Linux please help me…. Thank you for the excellent review. What I personally like about Bodhi Linux is that somehow it manages to combine two, supposedly, incompatible features: lightness and eyecandy, and it does it outstandingly well.